Microsoft gains increased possession of national assets funded by taxpayers, based on this new report. Microsoft, meanwhile, has a deal with NASA under which more than 100 terabytes of data will be available through the Microsoft Worldwide Telescope. 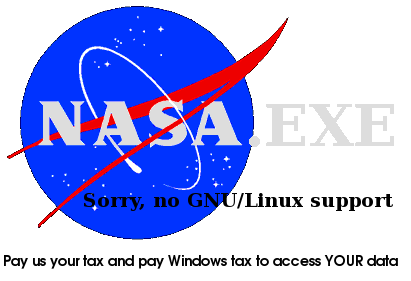 Why is NASA handing over public data to a company which was sued by the United States government and found guilty? Need it be added that Microsoft uses this as an opportunity to block GNU/Linux users?